and examination of the direction in which the price is moving. 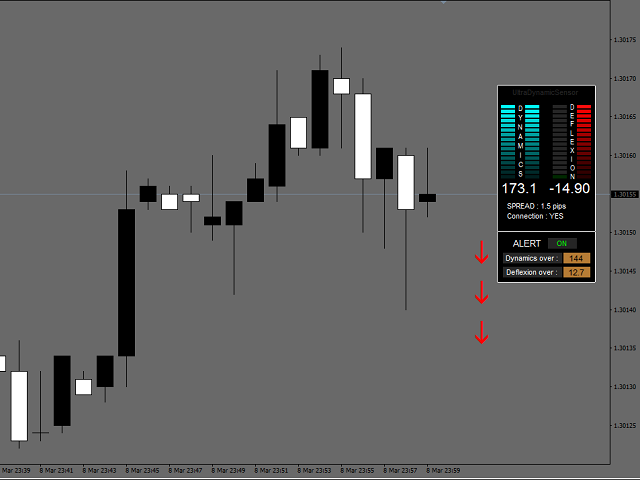 Indicator due to its nature, is dedicated to TimeFrame M1, but it can be freely used on higher TF'ach. Calculation and display will be identical to the M1. 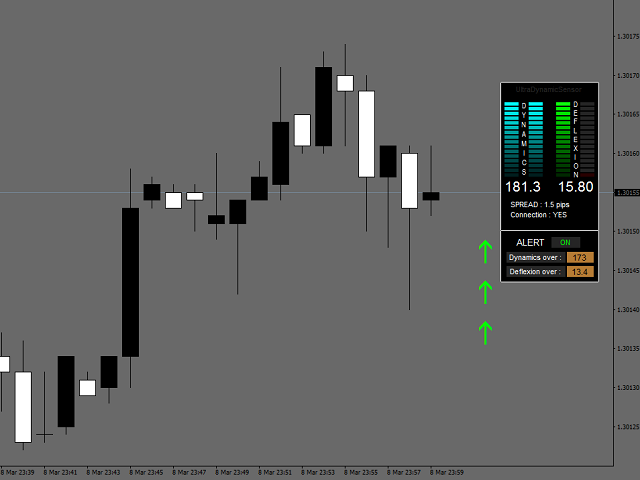 Indicator all calculations done on ticks, ie single price movements. Are not taken into account the conditions candle (the color of the candle, the candle shape, values : open/close/high/low). The all values are displayed in the form of an object on the chart. Ultra Dynamic Sensor is an excellent tool to confirm the signal in strategies related with breakout. is acceleration. If the price does not increase the growth rate is not likely to be a further impulse. However, if the growth rates accelerated a treat this as a signal confirmed. - in breakout of price which is a signal of other indicators. You can also use it during important macroeconomic data, just waiting for the proper hour. Ypos - positioning the indicator in the vertical ( the higher the value, the more to the down ). TA_period - period TickAverage ( the amount of the last ticks to calculate the TickAverage ). On its basis is calculated, inter alia deviation Deflexion. end_scaleDM - final value of the marks Dynamics. Above this value, all the marks will be in color. end_scaleDX - final value of the marks Deflexion. Above this value, all the marks will be in color.